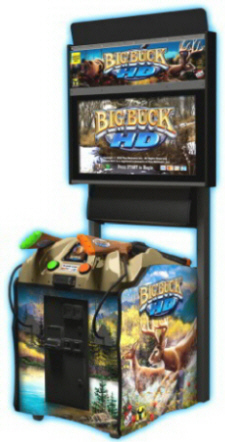 Big Buck HD is the first game of its kind designed with true 1080p high definition graphics and new game functionality that will change the video hunting experience forever ! Big Buck HD features "always on" online connectivity, which allow players to track scores through their online accounts and compete in tournaments against players from across the country for cash prizes and fame ! • Ground Breaking New Live Online Gameplay Features ! • Play Against Other Locations Or Players Worldwide ! • Online Promotion Of League and Tournament Play ! • 1080p HD "Cinema Quality" Game Graphics ! • New "Dangerous Trophy" Animals ! • 100% Brand New Big Buck Hunter Gameplay ! • Facebook and Twitter Feed Integration Drive Attention ! • New Credit and Debit Card Acceptors Now Standard !